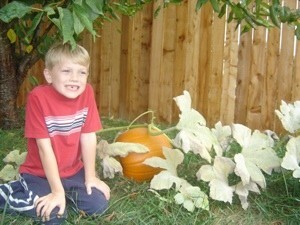 Here is my son Ethan in our volunteer pumpkin patch. We didn't plant them, they must have grown from last year's Jack O' Lantern seeds. I think we dumped them into the compost and then spread it out over this section of the yard in the spring. Pumpkin sprouts are rather distinctive so I put a little fence around the seedlings to keep someone from trampling on them. 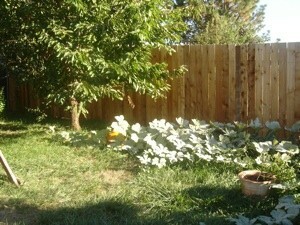 The vines took over a large section of our yard, they go back the other direction for even farther. We have 4 pumpkins that grew, two of them quite large. I got quite a few tomatoes from volunteers this summer too. I remember that my mother always seemed to have food growing in and near her compost pile: potatoes, zucchini, cantaloupe. Wonder what I will discover next year! That just gave me a great idea, I have a large compost area for only leaves that has been going for almost 30 years, and I have a bunch of seeds that are mixed together. I'll just broadcast them in the area this Spring, and go check it out later to see what comes up, and transfer them over to my lawn area. This year I did a lot of seed growing in containers, and actually a lot more work than was really needed I think, so, this is a good way to get them growing "on their own" the natures way anyway. :) They will get enough sunshine, and fairly protected area, and the compost will keep the water longer in all that compost. Most of the seeds are things that animals won't eat the plants. It will also be a good place to put vegetable seeds out there too, tomatos, squash, and melon plants can easily be transferred, or even leave them there. the eggplant can't though. I got a lot of tomatillas, and some got frozen, those would be a good place to throw those there too. Also, another place to throw older seeds out there too, you never know what will actually come up. :D Less wasting garden space if they might not come up. Ohh, another place for there would be for amaranth seeds, they can reseed as much as they want to each year, and it's good food. Great photo's too Jess, that is wonderful that you got some new pumpkins for this year too. This year I got a lot of dill and cosmos that came up from last year. We have three beautiful perfect pumpkins that volunteered from one that we left in a flower bed for the squirrels and chipmunks to eat last year. Never noticed any chipmunks but the squirrels loved them! I didn't recognize the leaves when they first came up this year and assumed they might be squash. Was very happy when they turned out to be pumpkins instead as I have never had luck when I planted pumpkin seeds on purpose! The seedling always disappered within a few days!